(NaturalNews) A team of researchers from Louisiana State University has made a fascinating new discovery with regard to the health benefits of chocolate. Announcing their findings at the recent 247th National Meeting & Exposition of the American Chemical Society in Dallas, the group explained how beneficial bacteria in the gut actually convert chocolate compounds into anti-inflammatory nutrients that help protect against stroke and heart disease. Using three different types of cocoa powder for their experiments, the scientists tested the effects of chocolate consumption using a model digestive tract made of test tubes. The tubes were filled with typical bacteria colonies found in a healthy human digestive tract and exposed to chocolate for the purpose of initiating the anaerobic fermentation process, which is what converts food into digestible nutrients. Cocoa powder, in case you were unaware, contains a variety of polyphenolic antioxidant compounds as well as dietary fiber, both of which are poorly digested and absorbed during the initial stages of consumption. But when these substances eventually reach the colon, they are apparently broken down by special bacteria that convert them into different compounds that the body can actually use. Specific probiotics in the gut, the team discovered, literally consume ingested chocolate before it is fully metabolized in order to transform it into more basic nutrients that the body can use for health maintenance. In other words, beneficial gut bacteria act as microscopic food processors during the digestive process, converting whole foods into their many nutritional metabolites. Dr. Finley agrees, having observed that not only does the gut take charge in converting chocolate into what can only be described as anti-inflammatory medicine, but it also works with the prebiotic fibers found naturally in chocolate to accomplish this. It is these fibers, which the human body is unable to process on its own, that feed probiotic bacteria and lead to their multiplication and spread, which in turn boosts immunity and protects against disease. “When you ingest prebiotics, the beneficial gut microbial population increases and outcompetes any undesirable microbes in the gut, like those that cause stomach problems,” he added. Though the research team used cocoa powder for its experiments, the best way to take advantage of the health benefits of chocolate is to consume cacao, and preferably raw cacao. Many cocoa powders and chocolate products contain cocoa that has been treated with alkali, an agent that reduces its antioxidant potential. Many conventional chocolate products are also loaded with processed sugars and genetically modified (GM) soy lecithin, which can cause other health problems. 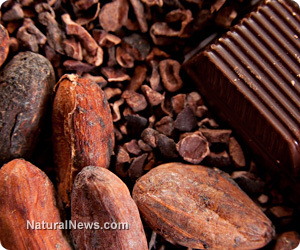 Besides containing the natural prebiotic fiber necessary for the activation of nutrient-producing probiotics in the gut — processed chocolate lacks this fiber — all-natural cacao is an excellent source of bioavailable magnesium, as well as mood-enhancing nutrients like phenylethylamine (PEA), anandamide and theobromine. Cacao is also highly neuroprotective, which means it can help protect against cognitive decline. This entry was posted in Health and tagged chocolate, diet, Farmington Hills chiropractor, health, Inflammation, research by tiptonchiro. Bookmark the permalink.